The David was a psychedelic rock band in the late 1960s and early 1970s, comprising Warren Hansen on organ and vocals, Mark Bird on guitar, Chuck Spieth on bass, and Tim Harrison on drums. 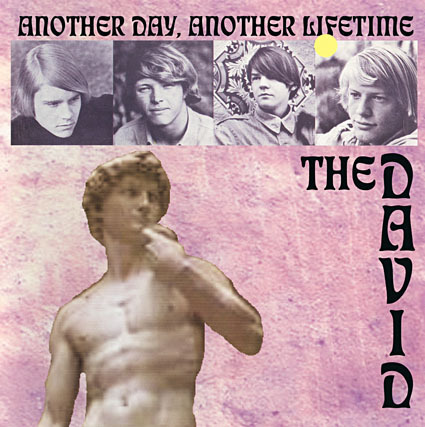 The David released only one album, the obscure 1967 Another Day, Another Lifetime. It is reported that the album employed a novel instrument called the “plasmatar” created by Hansen. Gene Page, who would later go on to fame in the disco era, produced strings for this album. Gene Page’s brother, Billy Page, writer of “The In Crowd” (among other songs,) gave advice in the pre-production phase. In 1967 the band members were ages sixteen to seventeen and, aside from a few singles with 20th Century Fox, this was their first recording project. Due to the high cost of record production at the time and the lukewarm commercial response, further recordings were not in the offing and the band, after experimenting with additional material, broke apart. The lead singer and keyboardist, Warren Hansen, became an engineer concerned with environmental issues. Drummer Tim Harrison manages property in Venice, California and Mark Bird, lead guitar, is a physician in Orange County, California. The group’s bassist, Chuck Spieth, died in a house fire at the age of 21.